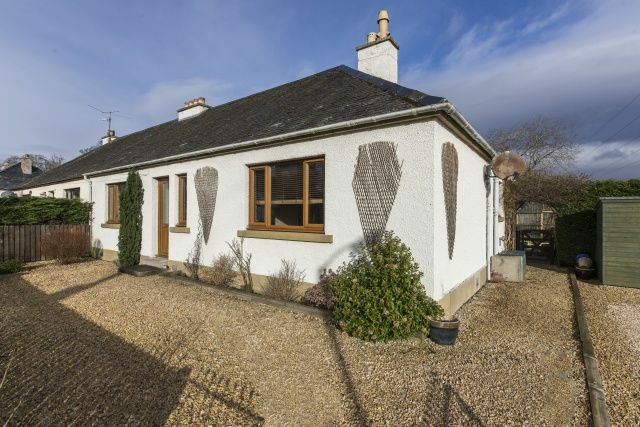 This truly unique property offers an amazing opportunity to purchase a stunning three bedroom semi-detached cottage located in a quiet setting next to the historic Glen Ord Distillery. This lovely home has been considerably renovated in recent years to provide a luxurious and contemporary living space on two floors.The enhancements are all-embracing as the large entrance hallway opens to a superb open plan lounge/dining-room/ kitchen, two bedrooms and a bathroom on the ground floor. The open fire in the lounge provides a real focal point with the eye-catching cathedral style patio doors leading out to the rear garden from the dining room. The imaginatively designed kitchen comes with black granite work tops, a Butler sink, large electric cooking range and retro-style Smeg fridge/freezer. The property has been tastefully extended to provide an upper floor whilst still maintaining the integrity of the original cottage design from the front. The solid oak staircase ascends to this clever layout with its spacious master bedroom and ingenious window / balcony combination providing views to the field and hills beyond. The splendour is maintained and exceeded with a sumptuous bathroom complete with spa bath, separate double shower cubicle perfectly complemented by underfloor heating. The property also benefits from the provision of double glazing and oil-fired central heating. The front garden has been laid mainly to chips allowing driveway parking for a number of vehicles whilst providing a low maintenance environment. A sturdy garden shed and separate large wood store are also included. The private rear garden is enclosed and has been beautifully landscaped to allow maximum enjoyment of this outdoor space and is laid to a mixture of decking, lawn, chips and mature shrubs. A picnic table, dog run and large shed complete this peaceful setting. Extras (Included in the sale): Smeg fridge/freezer, kitchen range, various out-buildings.